Good product, fast shipping, great choice. IPSC brasilian shooter. Thanks for the quick turnaround. Bought the CED7000 which works as advertised. Used it at home for dry fire exercise and at the range for some IPSC training. Nice and compact. Thanks. Great product. I love that you can set all of your par times for running stages for different Qual courses. I Bought The CED7000 Timer,Under The Timer Builder Option, I Had Great Service and The Product Got Here In Good Condition And In Less Than Two Weeks. Bought the CED7000. So far it works great at the range. Will use at future competitions. Nice size and I love the neck strap which allows for me to time myself at practice. Second thoughts tat I should have bought the WiFi model and display for use at the competition. Hope it is as durable as it looks. 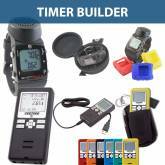 This Builder requires a Shot Timer and at least 2 Timer accessories to be activated. Our “BUILDER” tool is an online “Custom Bundle” creation tool, which allows you to create a bundle of products to benefit from available discounts. Our Timer Builder is bundle designed to allow you to add a Shot Timer of your choice and Timer accessories together in a single place. No longer are you restricted to choosing from pre-defined packages to take advantage of the savings offered on these items. As you build your Timer Bundle, the full price of the items chosen is displayed, as well as the discounted price you will be paying.